This is one of the least expensive favor fillers you can use. It comes in many scents, but the "Baby Powder" scent is the number one choice for baby shower favors. 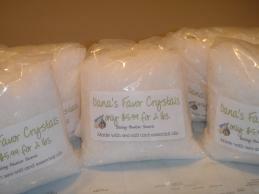 2 pound bag of white favor crystals. This is one of our most popular fillers. It is easy to use and smells great. They're made from medium grain sea salt and scented with essential oils. We use no dyes and only the finest oils.